for events shows and more. 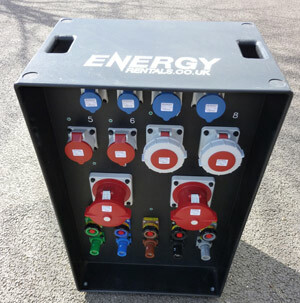 Energy Rentals supply Multicore and single core cabling from 16amp to 600amp, in lengths ranging from 5 meters to 150 meters suitable for all types of usage and environment. We hold a large stock of industry standard 5-channel cable ramp, available in 1-meter sections for use with all types of vehicle traffic. Energy Rentals are happy to offer all equipment on a “dry hire” basis to any client who has the knowledge and experience for correct and safe usage. We design, manage and install bespoke power solutions for green field sites, outdoor festivals and special locations. In fact wherever or whatever your power requirements are, Energy Rentals are the company to provide your solution. Energy Rentals supply containerized, skid mount and Road tow gen sets with sync & paralleling capabilities for event sites, concerts, green field sites and various bespoke event sites with back up and utilities. Energy Rentals supply to the industrial sector with back up and planned power solutions. We supply to all types of businesses 24 hours a day, 7 days per week. Energy Rentals hold a large stock of tower lights, discharge and halogen flood lighting, fluorescent and festoon lighting. Plus emergency and safety system lighting as well as a mixture of coloured architectural site lighting for buildings, historic backdrops and gardens. Energy Rentals stock and supply various types of transformers for touring productions, festival and event sites as well as industry solutions.